The Palestine Photography Project is an initiative of KARAMA, an independent non-profit corporation in San Diego, California. KARAMA selected photos for this site from the Library of Congress Eric and Edith Matson Photograph Collection, which contains over 23,000 glass and film negatives, transparencies, and photographic prints created by the American Colony Photo Department and its successor, the Matson Photo Service. The collection transferred to the Library of Congress between 1966 and 1981, through a series of gifts made by Eric Matson and his beneficiary. Since then the images have been digitized for archival preservation by The Library of Congress. Photograph descriptions are based upon the Library of Congress text. The photographs in the collection were taken between 1898 and 1946, a time period that spans the final years of the Ottoman Empire, the creation of the British Mandate of Palestine by the League of Nations, large-scale Jewish immigration to Palestine under the auspices of the World Zionist Federation, and the rise of a popular movement for Palestinian independence. 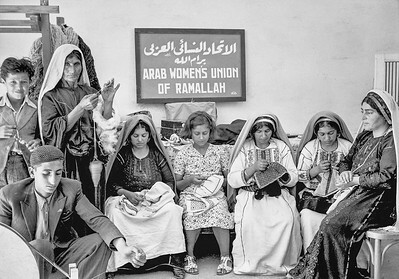 The Project reproduces these images of pre-1948 Palestine for exhibition in galleries, museums, universities, libraries and other appropriate venues worldwide. In addition, images are available for purchase in a variety of formats. In some reproductions, imperfections in the original file were retained as examples of their deterioration prior to being rescued and digitized by the Library of Congress. Learn more about KARAMA at www.karamanow.org and like us on Facebook.